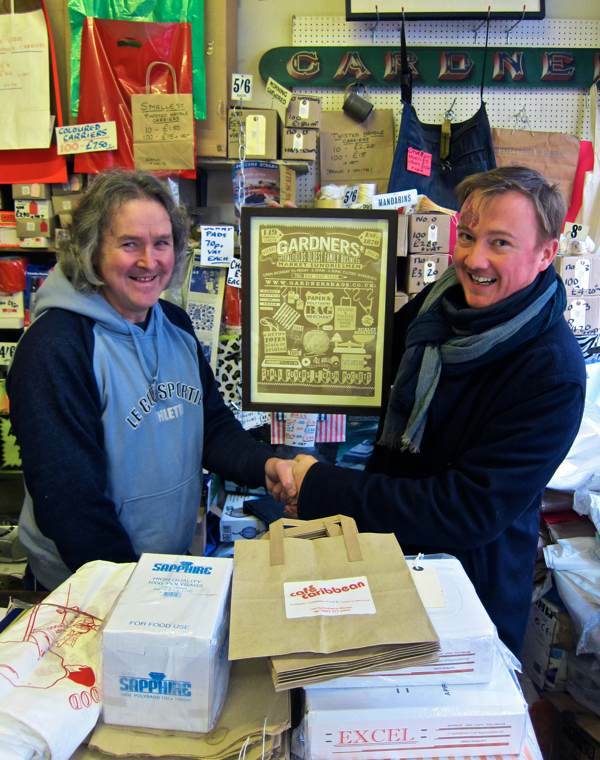 This is illustrator & printmaker, James Brown, presenting Paul Gardner, the fourth generation paper bag seller, with a copy of the beautiful print he has created to celebrate this beloved and historic Spitalfields institution, Gardners Market Sundriesmen. 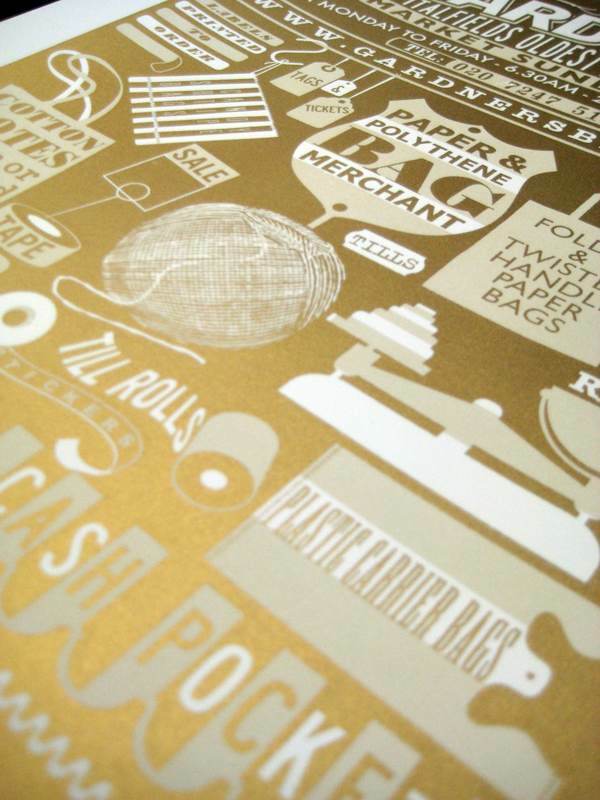 When a one hundred and forty year old business advertises for the first time, something special is required and – working in collaboration with Paul – James has contrived a paper bag printed in gold and emblazoned with symbols of all the different items to be purchased at Gardners. 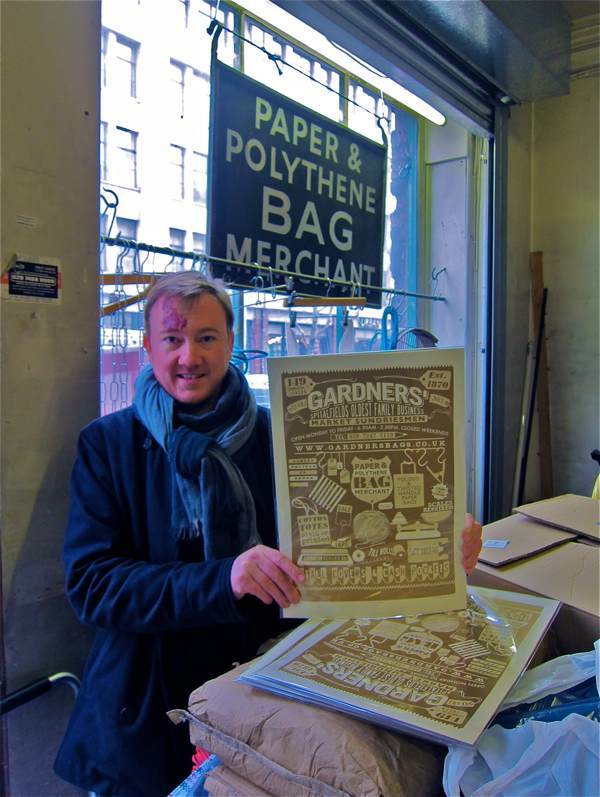 “Knowing about Paul and his story through Spitalfields Life, I thought it would be great to produce a design that he could use as a promotional flyer and that I could also make into a nice limited edition print too,” explained James shyly, standing in front of Paul and aware of the huge departure this first piece of advertising represents for Gardners. Through supplying the bags, in this area traditionally occupied with small shops and markets, Gardners is naturally the epicentre. Yet with new people coming to set up stalls and open shops all the time, James’ beautiful postcards of his print constitute an ideal introduction to this uniquely appealing shop that will sell you as few bags as you need. 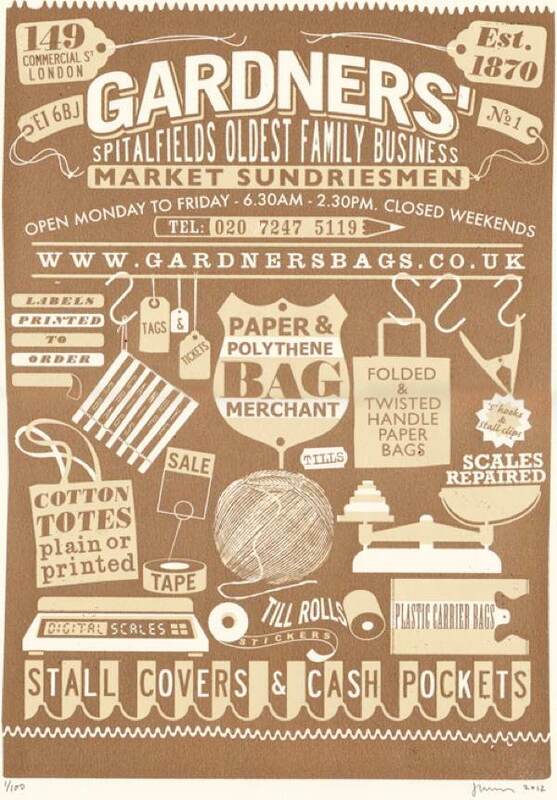 In coming days, James & I will be distributing the cards in shops and markets on Paul’s behalf, but you can pick up some yourself direct from Gardners Market Sundriesmen and take the opportunity to admire the limited edition print, if you happen to be passing through Commercial St.
James’ screenprint celebrating Gardners Market Sundriesmen, Spitalfields’ oldest family business. 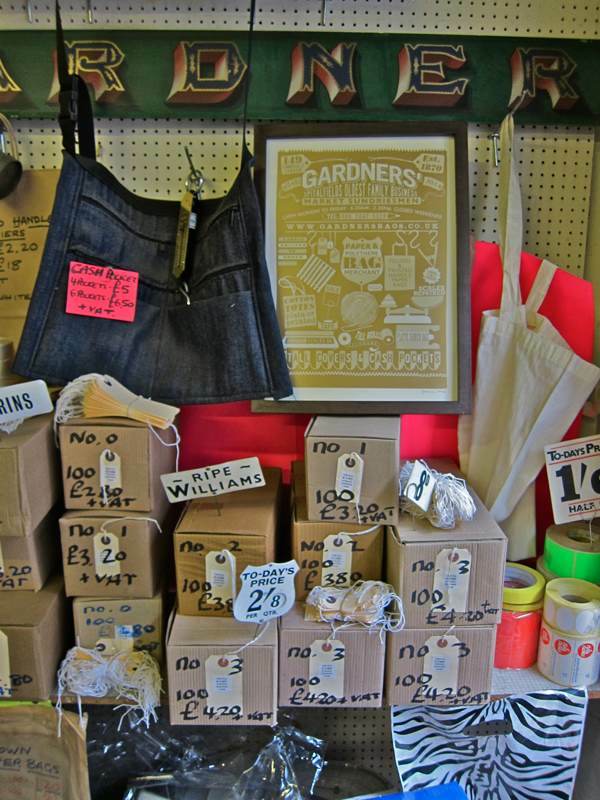 James Brown’s Gardners Market Sundriesmen print is available from Paul Gardner at 149 Commercial St, online from www.generalpattern.net and from Elphick’s Shop on Columbia Rd. Brilliant! It’s great to know that locally based businesses such as this still exist. And so stylish too. What a lovely idea, absolutely beautifully carried out by James. It’s great to see that sort of work. We NEED ONE! 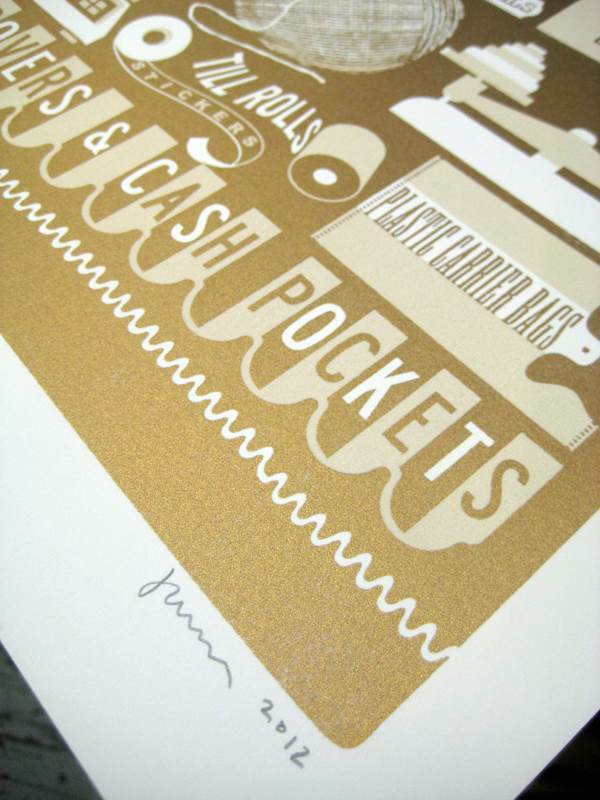 Well done James – you never cease to amaze me with your creative abilities. Can we buy them from Paul direct? Paul phoned and told me you bought one from him. Start with simplicity at the root and you can’t go wrong – paper bags!